Here is the only starter maker in Japan which deals in Tempe used soybean's protein as health food. Tempe which is eaten by people in Southeast Asia live on, especialy Indonesian, is in the spotlight as heath food in Japanese food industry. The Indonesian eat soybean which is rolled with banana's leaf after boiling and then fermented of their own accord at 27～30℃. 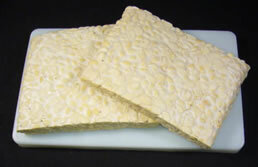 In our country, clean Tempe on industry has begun to make with selected fungi which are produced by bacteriological pure culture. 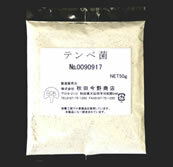 Starter of Tempe was axenically incubated and provided with safe and clean fungi by minute cooperetion between the Food Synthesis Institute of the Ministry of agriculture, Forestry and Fisheries and Akita Konno co., ltd.
Vitamin B2 and B12 in soybean severalfold increase through Tempe fermentation. Lecithin and higher unsaturated fatty acids (linoleic acid, linolenic acid) are contained much and they remove stored cholesterol and another fatty acids in circulatory system by emulsification and dispersal. Lower calorie than meat (201 kcal/100g).